You are invited to a wedding; one with a difference. In The Knot, a follow-up to 2016’s The Happiness Project, Didy Veldman sets out to explore ideas about marriage, in particular the ritual and how matrimony continues to be romanticised despite the changes it has undergone as it has become part of today’s throw away culture. What The Knot doesn’t do, at the time at least, is make you reflect on the social and personal significance it has in modern-day society. That’s because Veldman simply bowls you over with the flood of ideas and sheer inventiveness of the choreography; and that’s before we get to the seven fabulous performers who variously take on roles of bride, groom, bridesmaids and guests. Themes are explored literally and metaphorically. Anxieties and expectations, doubts and the magic of the big day, and the meaning of ‘forever’ in sections that move seamlessly from one to the next. In the less literal ensemble sections, the dance is expansive, the cast flooding across the stage in waves of movement that never fail to delight. Veldman even gets round to staging a wedding, complete with a few members of the audience as guests who get to dance a little with the cast and take part in the obligatory wedding photographs. There’s no hint of embarrassment as, for once, the participation works rather well. It is the perfect day, but then Veldman treats us to a super reflective solo after the obligatory photos have been taken. Dane Hurst seems full of doubt. ‘Was it the right thing to do?’ you almost hear him asking. There are expectations about the day but the weight of expectation about married life sometimes hangs heavy too. 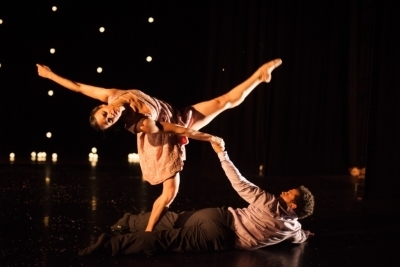 Another of the many highlights sees a super duet performed with a physical knot on stage when a couple of the dancers dance with their wrists symbolically bound by a red strip of material. Veldman’s quirky humour is well to the fore, most notably in a slow-motion sequence where the bride’s bouquet is tossed; although here, it is thrown by a man. See, gender issues too. The slowing down allows for every gesture and expression to be magnified. I guarantee you will smile. There’s more slow-motion at the beginning, when the cast prepare for their big day, the men and women each getting dressed in unison. 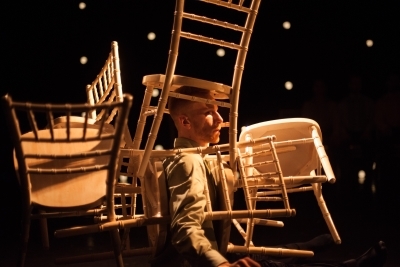 The 18 chairs initially scattered around the stage play an important role. After all, who sits where is immensely important at any wedding. They are constantly reconfigured, so shifting the performance space; stacked on top of Oliver Chapman’s head and shoulders, a metaphor for the weight of expectation perhaps; used to create a rather beautiful arched doorway and more. The dancers are all outstanding. They are at one with what Veldman’s choreography is all about. Dane Hurst really catches the eye, though. It’s not only his strength and control, but the depth of feeling he projects when he needs to. 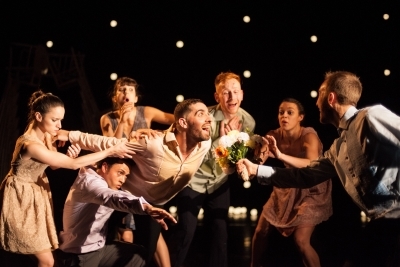 Musically, Stravinsky’s unrelenting but exhilaratingly powerful Les Noces is combined with what Veldman calls ‘musical space’ by composer Ben Foskett that allows more freedom in the choreography, and of course for the show to last an hour. The two sources meld well, Foskett picking up on ideas and instrumentation from the older score. I’m also sure I head something akin to church bells at one point. It is the power and sheer energy of the Stravinsky that wins out, though. It has a sort of rhythmic joy about it that just makes you want to move; and it does get the most dynamic choreography. The Knot continues on tour. Visit www.umanoove-didy-veldman.org for dates and venues.